Crate training a puppy is a controversial subject. Some people think that crate training is nothing short of dog imprisonment. In contrast, other people insist that a crate offers a cosy and safe den-like retreat for a dog to enjoy. The debate for the pros and cons of using a crate rages on, in part because of how people use them. Unfortunately, crates have got a bad name because they are used as a management tool in place of adequate training. The result is that dogs often get left in a locked crate for long periods of time. Alone, bored and without the ability to relieve themselves dogs get frustrated and distressed. So, can we have a crate in which our dog enjoys spending time? Can we use it as a management tool without causing distress to our dogs? The answer is that any tool, used in the right way is useful, and any tool used in the wrong way can cause harm. A crate, used in the right way, can provide a number of advantages for both you and your dog. Not only does a crate offer a safe and cosy place for your dog to relax but it also provides you with an efficient way of managing a, as yet untrained puppy. So, why use a crate? If your dog enjoys being in their crate, it is a perfect management tool. However, crates can also cause problems. Most issues are caused by using a crate as a means of punishment or keeping your dog contained and isolated for too long. Dogs are social animals and become miserable if left for alone for long periods of time. Not only that, but dogs also need mental stimulation as well as physical exercise to keep them happy. Prolonged periods contained in a crate can lead to a bored and unhappy dog. Crates come in various sizes and materials. Choosing the right one is key to keeping both you and your puppy happy. 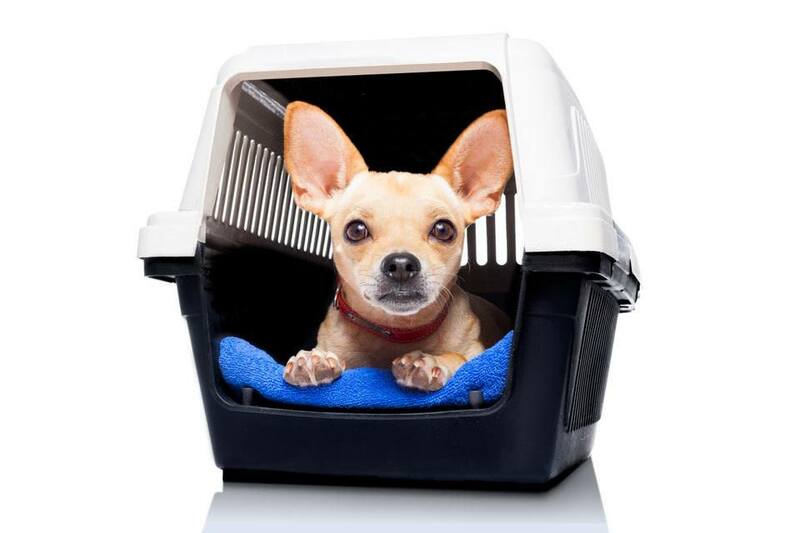 If you are planning to travel with your dog, a moulded plastic crate is the most common type allowed on airlines. So, you may have to crate train your dog twice if you use a different version at home. Size does matter when it comes to choosing a crate. A crate that’s too small will be uncomfortable for your dog. Whereas a crate that’s too large will allow your puppy to use one end as a bed and the other end as a toilet. The ideal size of crate allows your dog to comfortably stand up, turn around and lie down with legs outstretched. As your puppy grows, their crate should as well. Metal crates with internal dividers are popular as they allow you to adjust the size of the crate as your puppy develops. Place your dog’s crate away from draughts and heat sources like radiators or direct sunlight. Make sure you position the crate so that your puppy can’t reach cables, curtains or anything else they could chew on. There’s nothing wrong with putting your puppy’s crate in your bedroom. In fact, until your dog gets used to being alone it can help make your puppy feel safe to be with the rest of the family. Filling a crate with soft furnishings is tempting. However, puppies chew. So, it’s important not to fill a crate with too many blankets and towels until you know whether your puppy is likely to rip up and ingest the material. A soft waterproof pad or a piece of Vetbed is ideal. A chew toy or two is a useful way to encourage appropriate chewing. It’s unrealistic to expect that your puppy will be happy to sleep in their crate all night as soon as you bring them home. Not only will they be in an unfamiliar place, but it might also be the first time they’ve spent time away from their mum and siblings. In fact, as a puppy’s bladder is extremely small, no matter how well they settle in, your puppy may still need to get up and relieve themselves during the night. As a crate serves multiple purposes, it’s essential that your dog sees it as a pleasant place to go. So crate training should be a positive experience for your dog. Since dogs learn at different rates, patience is vital. Never force your dog in their crate as they are unlikely to want to use it long term if they see it as a punishment. By far the most crucial aspect of crate training is making the crate a pleasant place in which to spend time. Luckily, as puppies are so inquisitive, getting your puppy to explore a crate is easy. Food and toys placed inside are a great way to get your dog to investigate their new den. Any time your puppy shows interest in the crate or ventures inside, praise and treat them. The more you build up a positive association, the more relaxed the training process becomes. Feeding your puppy inside the crate is another way of getting your dog relaxed inside. If your puppy is still unsure of entering the crate you can place their food bowl outside and gradually move it closer until your puppy is happy to eat inside. Once your puppy is comfortable eating their food in their crate, you can work on shutting the door. Once your dog gets used to the crate and is going in and out happily, you can start to train them to spend longer inside. But build this up slowly by closing the door for a few seconds at a time. Ideally, if you’re feeding your puppy three times a day, it provides a perfect opportunity for door training. Alternatively, interactive feeders are an ideal way to keep your dog relaxed and occupied as part of this process. The aim is for around fifteen minutes of crate time, with the door closed without your puppy getting stressed. To start with though work on five to ten-second intervals. When your puppy starts eating close the door, wait for five seconds and then open it again. If your dog remains relaxed, close the door again for five to ten seconds and then open it again. As you work on duration, make sure that you stay within your puppy’s sight. And keep an eye on them to make sure they remain comfortable and relaxed. While some dogs won’t notice a closed door if they have food to distract them, others aren’t fooled so easily. Once your puppy has mastered the closed door, you can begin to work on distance. When your puppy is in their crate with the door closed, take a step backwards, return and treat. Continue doing this, building up the distance step by step and the time in five-second increments until you can step out of the room. Once you leave the room repeat the time increments. Start by standing outside the room for five seconds and then ten seconds etc. until you can leave your puppy for five minutes while they remain relaxed. The time can then be built up in larger chunks, for example in thirty-second increments. If training throughout the day try to mix things up and vary the times that your puppy stays in their crate. How long is too long in a crate? If you crate your dog at night, they shouldn’t be left for more than four hours in their crate during the day. However, this relies on your dog getting enough physical and mental exercise and adequate opportunities to relieve themselves. In general, a puppy can control their bladder for an hour for each month of their life plus one until adulthood. So, a three-month-old puppy is capable of holding out for four hours before they need to relieve themselves. Overnight this time extends to around one and a half hours, meaning that the same puppy could last about six hours. While this guideline is useful, it does vary from dog to dog with some needing much more frequent visits. So, get to know your puppy and pre-empt your dog’s toileting needs. Sleepless nights are an unfortunate side effect of a new puppy. However, you can make it easier for both of you by placing your puppy’s crate in your bedroom. Although many people don’t like this idea, it doesn’t have to be permanent. Often a puppy’s first night away from home is distressing enough without being left entirely alone in a strange environment. You can either carry the crate from room to room or have two, one for night-time in the bedroom and one for daytime in another area of the house. The other benefit of being close to your puppy is that you can be available quickly to take them out to relieve themselves. If your puppy is under twelve weeks, they are unlikely to be able to hold their bladder for a whole night. So, as a guideline, take your puppy out after three to four hours and allow them to empty their bladder and then put them straight back to bed. If you eventually want your bedroom to be puppy-free, you can gradually move your dog’s crate further and further away until it is outside the bedroom. Finally moving it to where you want your puppy to sleep on a permanent basis. There are lots of things to try to minimise the chance of your puppy whining. Nothing is foolproof after all your dog is in a new environment, away from their mum and siblings and most likely on their own for the first time. However, mimicking the environment that your puppy has just left can make them feel more secure in their new home. Whining often gets puppy attention, and they will keep doing it if it works. Although it’s difficult to ignore, don’t give in as long as you are confident that your puppy doesn’t need a toilet break and is safe. 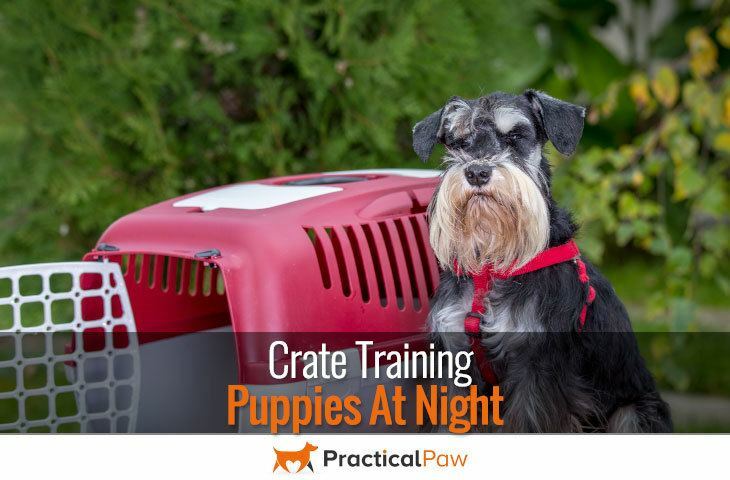 Crate training can provide you with a useful management tool. At the same time, it can offer your dog a safe and comfortable place to relax. Patience and consistency are key to training. So keep in mind the end goal of your puppy relaxed and happy inside the crate overnight or for some time alone. Efficiently used a crate is nothing more than a bed, somewhere that your dog likes to spend time. In fact, for many dogs, the den-like nature of a covered crate is preferable to an open bed. Each dog is different though, and some dogs never acclimatise to a crate, this is especially true for older dogs that are unused to being confined. Never force your dog to use a crate. If your dog is stressed confined in a crate, there are other ways of containing your dog without the need to lock them in a crate.